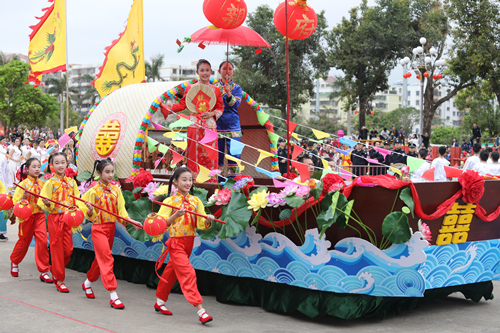 Local and out-of-town cultural heritages attracted 10,000 spectators to the 15th Doumen District Folk Art Parade kicking off a new year of tourist activities on Feb 17. After the opening ceremony at Doumen Stadium Square (斗门区体育馆广场) on Xidi Road (西堤路), the main venue, 1,500 performers, a bunch of them students, marched to GoTone Square (全球通广场) on South Guangchang St (广场南街). Long queues developed of those eager to see 36 thematic performances presented in 13 matrices. Six State-level and intangible cultural heritage items drew a great deal of attention. 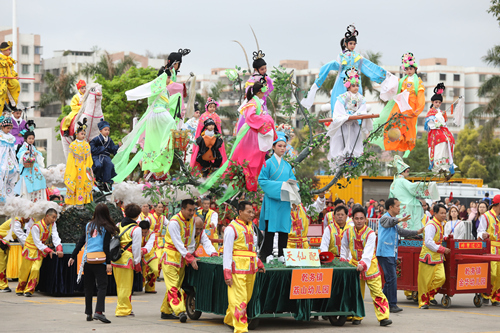 They were Catching Mudfish, On-Water Wedding, Sanzao Crane Dance, Puppet Shows, Long Drum Dance from Liannan Yao Autonomous County of Qingyuan City, and Leizhou Centipede Dance from Zhanjiang City. 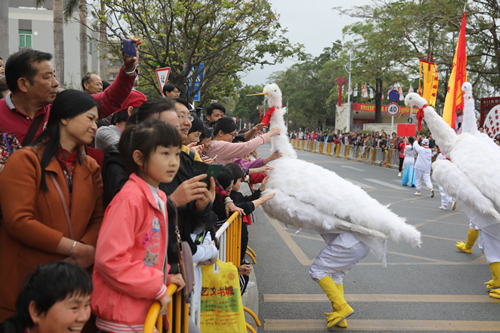 Lianzhou Fire Dragon, Imperial Kinsmen Sacrificial Rites, Qianwu Piaose Street Procession, and Qianshan Phoenix-Rooster Dance at provincial-level were also eye-catching. 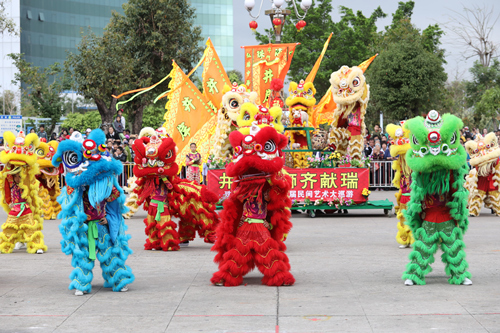 Fut Gar (a Buddhist martial art), and fan and lion dances were performed as well, with floating fish and shrimp paper lanterns adding atmosphere. The charms of Chinese cheongsams, a ladies' garment, were also demonstrated. Those attractions were complemented by shows from other cities, some debuting in Doumen. 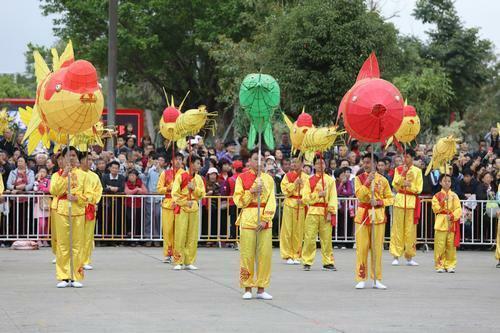 Chief among them was Yunfu City's Thatch-Dragon Dance, presented solely by female performers from Liantan Town. 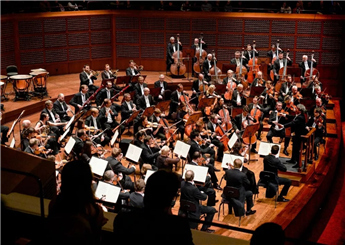 Its uniqueness is due to flexible dance movements and rhymed gongs and drum beats accompanied by uplifting suona music. Future inheritors of folk arts being cultivated throughout Doumen schools were given opportunities to practice. They will add to the vitality of local traditions, according to an organizer. The event was sponsored by the Publicity Department of the CPC Doumen District Committee and Doumen District Culture, Radio, Television, Press & Publication Bureau. 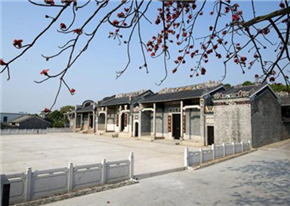 The Guangdong Intangible Cultural Heritage Protection Center and Zhuhai Culture, Radio, Television, Tourism & Sports Bureau provided guidance. 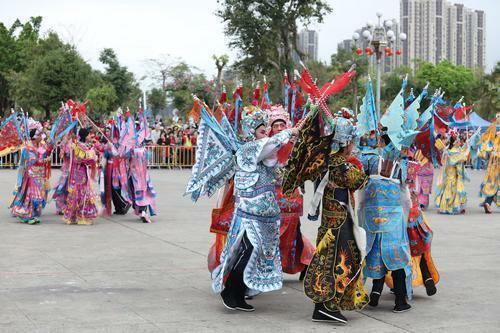 The 15th Doumen District Folk Art Parade will kick off at 9:30 am Sunday, Feb 17, from Doumen Stadium Square (斗门区体育馆广场) on Xidi Road (西堤路) and march down to GoTone Square (全球通广场) on South Guangchang St (广场南街), with 1,500 performers of all ages, 13 matrices featuring 37 themes, and more visitors than ever.